You are in for a real treat with Beachbody Challenge Pack promotions for October 2016. Fifteen of the most popular challenge packs are on sale. Huge discounts on Shakeology bundled with workouts, the 3 Day Refresh, & Performance Supplements. Your Challenge Pack includes: your fitness program, first month supply of Shakeology and 30-day access to Beachbody on Demand. The KICKSTART challenge packs also have the 3 Day Refresh included to help you jump start your weight loss and achieve your fitness goals faster. Grab one of these challenge packs and get your best solution to get fit (Need help choosing, contact me and I will help you pick the right one for your goals, likes and needs). Country Heat is the newest dance workout from celebrity trainer Autumn Calabrese! This high-energy, low-impact, country dance inspired workout is so simple anyone can do it! Plus, it’s so much fun you’ll barely notice you’re exercising while getting a great total-body workout. Country Heat is an easy-to-follow, 30-day fitness program that combines 5 high-energy, cardio-based dance workouts, 1 dance conditioning workout, and the portion-control Eating Plan to maximize weight loss and achieve a toned, tightened body in just 30 minutes a day. Love music? All Country Heat songs are set to the hottest country music, with songs that you’ve probably heard on the radio. Not only did Autumn pick these songs for their popularity, she specifically matched her moves to the faster and slower beats to create the perfect interval training within each routine. The result? A fired-up metabolism that burns maximum calories and fat! Also includes first month supply of Shakeology and your 30-day membership to Beachbody on Demand! 3-Day Refresh Kit to kick-start your weight loss, break the cycle of unhealthy eating, and visibly lose 3–5 pounds in just 3 days! 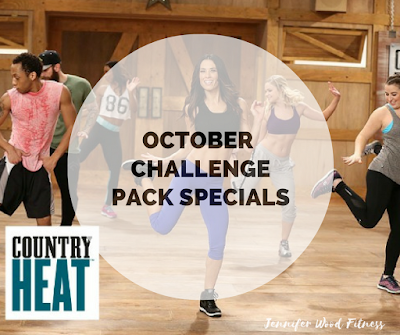 The Country Heat program, featuring 6 workouts on 3 DVDs, a set of 7 portion-control containers, a shaker cup, and the Country Heat Eating Plan to help you achieve your weight-loss goals. A FREE 30-day trial membership, so you can start streaming Country Heat workouts on Beachbody On Demand. This October, you have so many options available at great discounts. Need help choosing the right workout for your goals? Message me, or email me, and let's chat.